Email details to judy@asiahomes.com or Tel: +65 9668 6468, 6254 3326, 6254 2728, 9668 6469; Fax: +65 6256 0501, 64545 843 for viewing or updates. Newton subway is a 15 mins walk. Sat Dec 14 2002. Young Dutch couple wants to live near Orchard Road/Somerset subway. 10.15am Char Yong Gardens 3+1 1250 sq ft $3,200. 10th floor. Ceramic tiled living and dining area. View of California Fitness Club. Dated long bath tub in master bathroom. Likes the high ceiling and proximity to wife's office at Winsland House. Big lap pool and 2 squash courts. 10.25am 8 Hullet Road. Modern new. Appeals to young Caucasians. 3-bedroom 1151 sq ft $3,500. 4th floor. Pool and guard only. 18 units of 2 and 3 bedrooms. Master bedroom large with many closets and a homogeneous tiled wall with sparkling "stars". White bath tubs. Living and dining area spacious. Bedroom 3 has a bay window. Washer and dryer in concealed corner of kitchen. Metallic cook hood. Pine-coloured floor strips in living and dining. 11am Pinewood Gardens 3+1 1600 sq ft $3,800. Blk 25, 10th floor. No balcony. New bath tub and kitchen cabinets. Common bathroom is pinkish (original condition). Marble floor in living and dining area. 11.15 am Pinewood Gardens 3+1 1600 sq ft $3,500. Blk 23 5th floor. A balcony facing a vacant piece of land and a construction. Marble-tiled floor replaced by wavy rough ceramic tiles. Original blue master bathroom. 2pm The Loft 2-bedroom 1100 sq ft $7,000. Upscale. 2.30pm River Place 3+1 1500 sq ft $7,000. Upscale. 2.45pm Grange 70 3+1 1970 sq ft $7,500. Upscale. 6-min walk to Orchard subway. 3pm Melrose Park 4+1 1700 sq ft $6,000. 4th floor. Near Great World City shopping centre. 3.30pm Valley Park 3+1 1700 sq ft $5,000. Blk 475, 6th floor. 4pm Anderson Green 3+1 1701 sq ft $7,000. 6th floor,7th floor. Upscale. 4.45pm 1 Holt Road 3+1+1 1722 sq ft $6,000. 5pm Horizon Towers East 4+1 2600 sq ft $5,500. Facilities upgaraded. 5.30pm The Bayron. One unit of 3+1 1800 sq ft at $5,500 may be available in Feb 2002. Great location near Somerset subway. 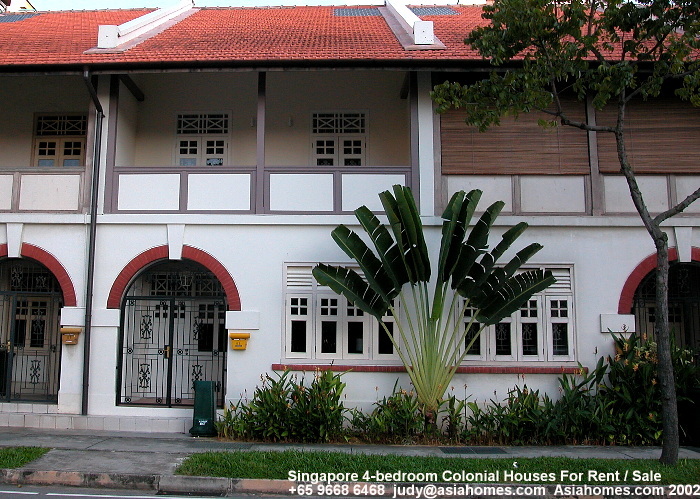 2-bedroom colonial house $2,200 for romantic and young Caucasian expats. 5-min taxi ride to Suntec City.